We will be happy to guide you in the right direction. The best place to start is to meet face-to-face on site so we get a feel for its contexts and surroundings. We will then take the time to learn about your thoughts and ideas, discuss the opportunities and planning constraints involved and guide you on the right path. We will answer any questions or technicalities you may have and provide a quote for our professional services. Before we can start designing, we need to establish the context for the scheme on areas relating to the proposal. This would be carried out via a measured survey. There are two common types; a measured building survey (ideal for home extensions) and an topographic survey (ideal for building a new home). A measured building survey will help identify the existing built form of the house and gather data to develop existing floor plans, elevations, sections. A topographical survey measures the site, neighbouring properties, landscape and topography. 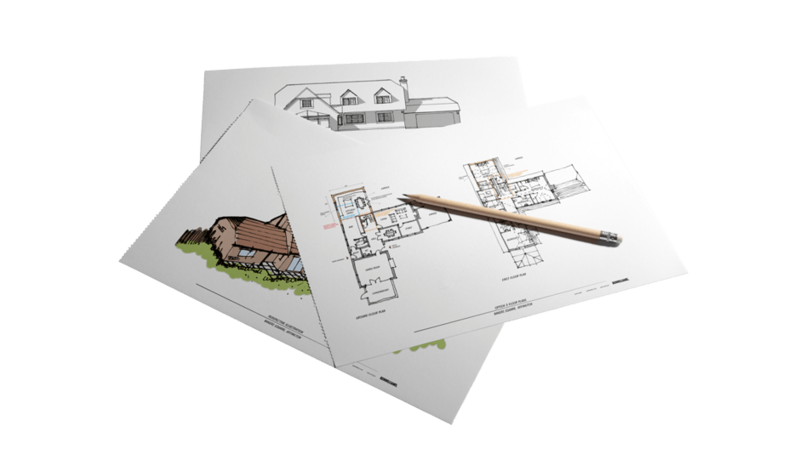 Depending on the type of project, a survey will be required to enable ‘as existing’ drawings to be prepared which will be required for later submission (for the planning application) but in the first instance, it will enable us to develop sketch proposals. Working with you producing feasible design options. It is important to develop the proposal in a co-ordinated way, working with you to ensure that the opportunities and constraints are fully appreciated and that the evolving design is fully understood. The process is simple – we compile our ideas from our initial consultation to fit within the context of the survey and share these with you to review and comment. If the proposal is not exactly to your requirements, we will develop further options until we have reached a viable solution. Once a sketch proposal is finalised, we can either submit a pre-application enquiry or develop the proposal further to enable the scheme to be submitted as a detailed planning application. Pre-Application advice with the Local Authority. If the proposed works are complex in nature, it maybe a beneficial expenditure in undertaking pre-application discussion with the appropriate Local Planning Authority. This will provide an officers view of the proposals to outline any issues that may hinder submitting a detailed planning application. This would incur an estimated timescale of 21 days for a formal response to be recieved from the planning officer. Submitting a detailed planning application. The proposal must be fully illustrated as scaled drawings showing as existing and as proposed. The drawings must illustrate floor plans, elevations, sections and the relationship to adjacent neighbouring properties. The drawings will also have to be accompanied by an Ordinance Survey map along with standard forms and the appropriate fee for processing the application. We would always indicate that prior to making the application; your neighbours are consulted informally to ensure that there are no issues of contention which may delay the application once logged. The application will be open to public consultation for a period of 21 days during which time, formal objection or comment can be placed on the proposed application by any party. It must be accepted that your neighbours may object to the application and will be considered by the Local Planning Officer and a view taken. On completion of the consultation period the planning officer dealing with the scheme will assess the planning application and potential comments made by interested parties and reach a decision. On the assumption that the proposals are not contentious, it is likely that the planning application will be considered under Officer’s Delegated Power of Authority rather than taking the application to a full Planning Committee. It is not uncommon for the Planning Officer to give an early indication of their decision before the eight week consultation period ends. They may also request a few minor changes to the proposed scheme to give it the best opportunity of gaining planning consent. Assuming the planning application is approved it is likely that there will be conditions attached to the planning permission. These usually consist of a requirement to obtain local authority approval such as materials, drainage, vehicle manoeuvring, working hours, which require then need to be further approved by the council. Some planning conditions require no further action while others require discharging prior to commencing works on site. Each application to discharge of a condition will attract a fee payable to the Local Authority. It is thus our recommendation to seek only one application to discharge planning conditions attracting a single fee rather than making several applications over a period of time attracting multiple fees. Need help with a planning application submission? Let us show you how we can help, please get in contact and we’ll get back to you very soon.